Whatever type of painting project you’re taking on, from furniture to your garden fence, paint sprayers can help you out. If you’re new to working with one of these tools, you could probably benefit from a few tips to make sure that your project is a success, not a mess! With that in mind, here’s our complete guide to working with one! We’ll teach you how to use a paint sprayer easily and effectively. Before you begin, you need to make sure that your workspace is fully prepared and equipped. You don’t want to have to stop mid-task to fetch something you need or to move some things around. If you are painting a larger item, you could benefit from building a stage which will keep the item at a convenient height for working. A sawhorse is ideal for this, however if you are painting a smaller item, you can simply use a lazy Susan which will be perfectly suited to the job. Before setting up your equipment, think hard about the space that you are planning on using. You will need to work in a location with plenty of ventilation to ensure that you are protected from the potentially hazardous fumes. If you can possibly work outdoors, do so. Otherwise, a garage with an open door is a suitable alternative. If you have no other option, you can work indoors, however you will need to open all your windows and switch a fan on while you spray and dry your item. If you are spray painting outdoors, check the weather to ensure that the temperature will be over 40 degrees. 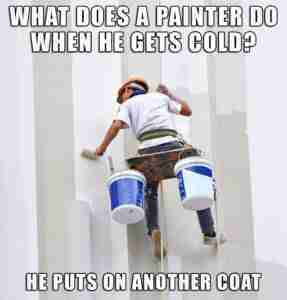 If it is colder than this temperature, the pressure inside the paint can will drop. Also, it is important to avoid spray painting outdoors during the rain. Plus, inclement weather will wreak havoc with your drying time. A lot of paint that’s sprayed has a glossy finish which highlights all imperfections, so you need to be sure to sand your item before cleaning and rinsing it and then, finally, drying it thoroughly. If you apply a primer, the surface will be smoother and you will obtain a finish which is truer in color and which lasts longer. If you are working with a large piece, lay down a cloth over your floor. If you are finishing a smaller project, you can set it inside a large cardboard box. Always read the can and manufacturer notes to check the correct spraying distance as well as the drying time before you start to paint. Spray a piece of spare material before you begin spraying the actual item itself. Make sure it’s coming out the way you intended before you continue. When you begin to spray paint, use even, long passes and always overlap the previous pass to ensure better coverage. Position your nozzle around 8” from the surface and apply several thin coats. Begin and end every coat off the side of the material and always complete a single coat in one session for a better finish and consistency of color. Allow each coat to dry before applying the next coat. Each brand of paint and different finishes all have different drying times. Always wait until that time has elapsed before you move your project. You can prevent clogging of the spray valve by turning the paint can upside down, spraying until just a clear gas is emitted. Should the tip be clogged, wipe the opening using lacquer thinner or warm water. Wooden Wicker – sand, wipe and prime before spraying. Always ensure your surface is dry before you begin. If you need some advice about choosing the right paint sprayer, check our homepage for more advice. Here are two of our faves! Anyone working on a smaller project will love this sprayer. It’s cost effective and efficient! If you are planning on working on furnishings or cabinets, this paint sprayer is very accurate and will spray pretty much any kind of coating as long as it is properly thinned. 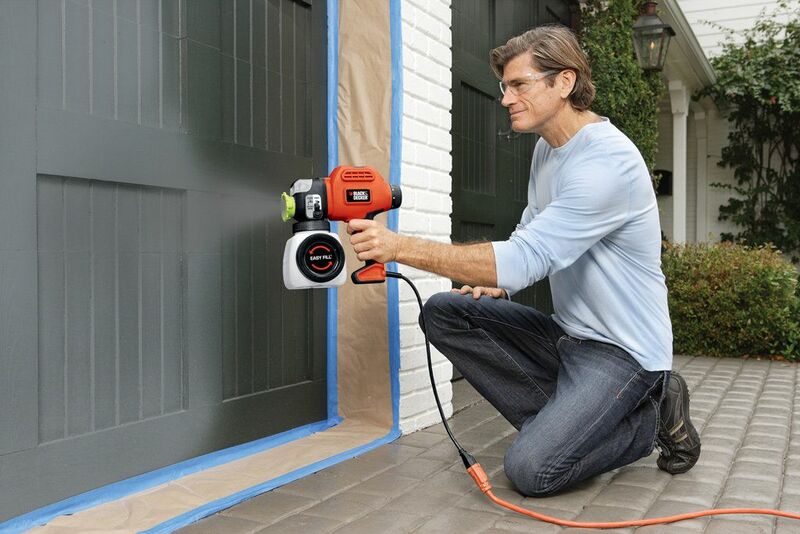 From furniture varnish to latex paint or deck stain, this thing can handle them all. It comes complete with a viscosity cup as well as a tool to help the user to work out the correct balance. There are also in-built filters which will help to prevent clogging of the tip. The flow of pressure can be easily adjusted and there are three different spray patterns to select from. Thanks to its brass components, it can last for a long time and is simple to clean thanks to the included cleaning brush. Find our complete, in-depth breakdown of the HomeRight on our homepage. 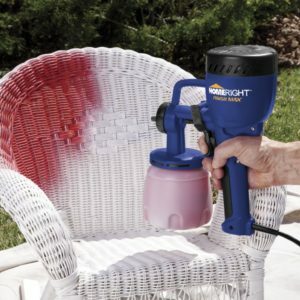 If you own an air compressor, this spray gun is a great choice for larger coverage areas. 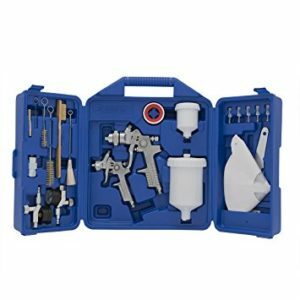 This piece of equipment comes with two ergonomically designed guns for both large and small projects, both supplied with adjustment valves, accessories and cups as well as a carry case. This affordable kit performs well and is capable of laying down a smooth coat of paint on all kinds of projects from cars and walls to furniture. The paint cup has a 550ml capacity and the spray pattern is adjustable up to 9” and the entire kit is very quick and simple to clean. We’ve got a more comprehensive look at the Campbell-Hausfield set on our homepage.